Villa Madonna Academy is proud to announce a new athletic team name. 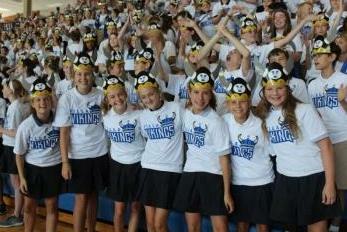 We are now the Villa Vikings! Students have been lobbying for a change for many years. They wanted a concrete symbol to rally around. Choosing the Viking made sense because it linked us to the past as our boys' teams were once known as the Vikings. Mr. Cordonnier added that few cultures had as much gender equality as the vikings. Women had equal pay, voting rights, and respect. The new Viking will represent girls and boys at Villa. Our students have been encouraged to design the new mascot. The top drawings will be submitted to alumni, students, and faculty for voting. Whether we are Vixens, Vipers, Blue Lightning, or Vikings, we share something special, we share a Benedictine tradition and we are all Villa Proud!